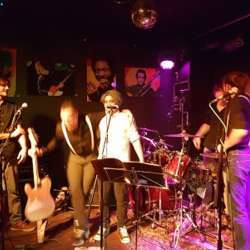 Let's go for a drink and listen to a free concert in Dudelange's famous Protected content The band N/EGO is playing ( Protected content ) from 21:00 until midnight. You can come by train. Start at 19:21 in Luxembourg City, Protected content Or meet us at 20:00 directly in the pub. To go back to Luxembourg City, there is a train every half an hour. The last train goes at 0:04.